We are nationally recognized leaders in preventative dental care, and we take every measure to help you maintain optimum oral health. When bone loss does occur, we are well equipped to handle it. When it is necessary to remove the molars in the upper jaw, additional bone may be reabsorbed due to expansion of the sinus cavity. With no teeth in place, the air pressure in the sinus cavity can cause the bone tissue lining the sinuses to deteriorate. Bone loss is a common consequence with chronic periodontitis (gum disease) and the resulting loss of teeth. With periodontitis, the bacteria gradually eat away at the underlying jawbone and at the periodontal ligaments that connect the tooth to the bone. Dentures can accelerate bone loss by wearing away at the ridges of bone they rest upon. Every time you bite down or clench your teeth you are placing pressure on the ridge, resulting in bone resorbing. This continual erosion of bones leads to ill-fitting dentures, sore spots and difficult or painful chewing. While bone is sometimes thought of as hard and static, it is, in fact, continually changing and reforming, and to be healthy, bone requires a stimulus. When teeth are missing, the jawbone deteriorates due to the lack of stimulation normally provided by contact of the teeth and moving of ligaments, i.e. chewing and biting. There are various options available for rebuilding bone, and our doctors will choose the appropriate treatment, or combination of treatments, for each individual patient to provide lasting, quality results. 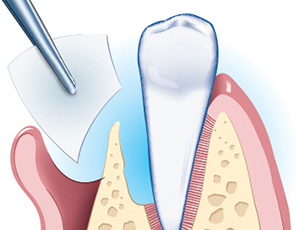 Bone grafting is a frequent component of periodontal surgical procedures. When needed, we can add materials to regenerate lost bone tissue. The material used for these procedures can be your own bone, bone from a tissue bank, bovine bone, or synthetic materials. Grafting bone can add years of life to a compromised tooth or even completely reverse the damage. Learn more about our bone grafting procedures. Guided tissue regeneration (GTR) is a process of injecting collagen to act as a barrier between tissues that heal more quickly (gums and ligaments) and bone. This procedure allows time for the bone to regenerate without the encroachment of the faster healing soft tissues. Dr. Weingarden was among a panel of international dentists who were sequestered until they were able to come to a consensus on the best method for regenerating lost bone. They established that the most effective solution was guided tissue regeneration. 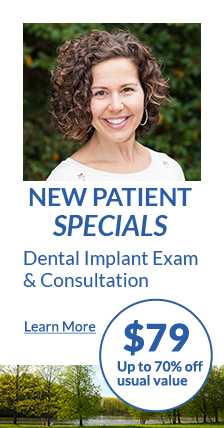 Dental implants are frequently needed in the back of the jaw. When your upper back teeth are lost and not replaced, the ridge bone resorbs and the sinus cavity expands, so that eventually the bone separating the sinus cavity and the oral cavity is very thin. Dental implants can’t be placed in such thin bone, and in these cases the doctor will perform a sinus lift. The sinus is raised by gently pushing up the membrane lining the sinus away from your jaw and packing bone graft material into the space where the sinus cavity was. Once the bone graft material has fully integrated with the jawbone, we can place your implants. With the advanced three-dimensional imagery captured by our CT cone beam scanner, our doctors can find areas of optimum bone density and may be able to help many patients have implants placed without the need for bone grafting or sinus lifts.